This is a rare opportunity to acquire one of the very few French Set series produced by Lustre Pottery; these were manufactured in the studio. It is not often these come on to the market and this one is in perfect condition except for some crazing found on these products. 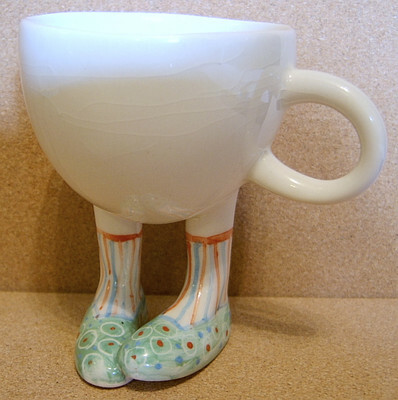 This delightful item is a Cup with Touching Toes in the French Set series. It is free handpainted with light green shoes with red, white and blue striped socks manufactured in 2007. It stands just under 3.75 inches (9.5 cms) tall. It is signed by Roger Michell under one foot with the hand scribed company name on the other.